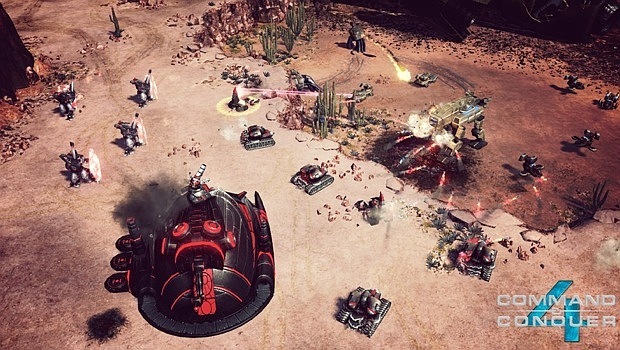 An early build of Command & Conquer 4 is being shown to media in sunny California. As the early survey suggested, there’s a lot of new in this next iteration of the now-classic RTS series. It has a persistent leveling system that works across every game mode, including skirmishes with the AI. Earning experience points is as simple as shredding the opponent’s troops, but there’s something fresh within the structure of the game: traditional base building, harvesting and turtling is toast. According to the 1UP preview, the game features a Battlefield-like structure. Tiberium relay nodes dot the landscape. Controlling these is the key to gaining resources and the reason for the game’s new class system. Also, there's no point in trying to anhilate your foes' bases as is C&C tradition. The game has player respawns. Like Battlefield, it's all about capturing and holding a position the longest amount of time. It’s a new game, folks, with new ideas and a gorgeous early sci-fi look. We’ll definitely be keeping our eyes trained on this.